W travels frequently for work. As such, homecoming meals have become something of a ritual for us. And sweetening the deal, par on course. Understandably, he doesn't want to be greeted by some exotic result of a far-flung flight of fancy - a trip I am not unknown to take on occasion, which he otherwise indulges in the ordinary scheme of things. Devil's food cake, brownies, chocolate chip cookies and other such like - the comfort of the familiar is what he wants to come home to. My taste in recipes is thus divided between two extremes. There's the thrill of the new - be it an unusual featured ingredient or technique or flavour combination. And there's the constant rediscovery of old faithfuls. Just when you think you may have finally baked the Holy Grail of brownie recipes say, along comes another that teaches you how to do it even better. A little less of this, a little more of that. A little extra something, skip it altogether. Temperature makes all the difference, baking time is key. The permutations and the possibilities they present ensure the quest for refinement alone will keep one plenty occupied. To this end - a particularly compelling number in my litany of cookbook purchasing excuses - two recent additions, both of which are exemplary recipe collections of the sort of all-American sweet treats W enjoys, who is returning after a long week away - what better reason for a bout of comfort baking? All too often, devil's food cake fails to live up to its wicked name. Bake through enough recipes and you'll know the pale (in colour and flavour) pretenders from the cardinally sinful with a quick glance at the instructions. Nancy Baggett's recipe in The All-American Dessert Book is a fine example of a devil's food cake with all the right attributes - richly rounded chocolate flavour, moist tender crumb, dramatically dark good looks. The requisite hue comes from combining baking soda with non-alkalized cocoa powder (as opposed to Dutch-process, which has had its acid neutralized) - bicarbonate of soda reacts with the natural acid present in untreated cocoa to intensify the colour and lend it a reddish tint. The icing on the cake? A fabulously fudgy frosting that spreads like a dream. 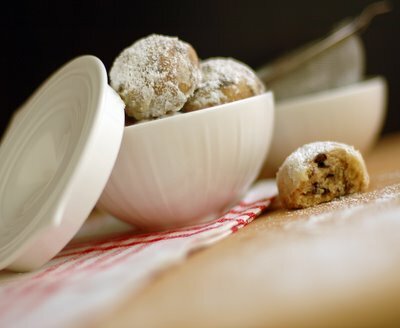 Chocolate chip cookie-meets-snowball in this delicate hybrid from Lisa Yockelson's ChocolateChocolate that delivers on its promise to melt in the warmth of your mouth. Once baked, the plump buttery pillows dappled with chocolate chips receive a thick powdering of confectioner's sugar. I just got Nancy Baggett's book and I like it already. I'm glad to see your gorgeous photo, J! I do think that Greg Patent's book is worth having. The recipes are good and he puts some little twists on things, like a bit of unusual spice or some wheat germ, which I like. OK - Are you a food stylist? Amazing as always...and I really enjoyed the explanation of the science behind the color. So many times I wonder why things turn out the way they do and how to alter them. Thanks! Jocelyn - your beautiful photography and prose continue to tempt me to buy cookbooks I don't have room for!! I have other cookbooks by both these women (who are, incidentally, both local writers!) and have really enjoyed them. Your choc cake looks sinfully good! Stunning pics as always J. Your attention to detail and food styling is always breathtaking. And I bet that cake tastes wicked as well. J, your photos are just breathtaking. Your devils food cake looks rich and chocolatey enough to be a Sacher Torte. Wow, I second what everyone said. I really like your attention to detail, and how you frame your shots. However, I am more interested in the baked goods. I really, really can use a slice of Devil's Food Cake right now. Wow...those Chocolate Chip Butter Balls must be very rich! The description alone is *impossible* to ignore. I love a really good devil's food cake and just by looking at the photo, I can tell that I could probably eat half the cake in one sitting! The chocolate chip butter balls sound interesting. They look just like the melting moments that I make. I think you're going to make me spend more money on cookbooks this weekend. *sigh* Delightful photos as usual. What a lovely job you always do. The photographs are stunning, as always. But I really enjoyed your writing on this one too. Chocolate chip butter balls? Now that's decadence. I just bought that book by Nancy Baggett and have also earmarked that devil's chocolate cake recipe. I'm glad to see that you think it's a success. :) Now I know it's a go. Yum!! More chocolatey deliciousness. I just bought Chocolate Desserts by Pierre Herme (which you probably already have :) ) from my recent visit to London's Books for Cooks and your chocolate desserts certainly inspire one to try making some myself! The pic of that cake is beautiful, and if only I had found that book instead of the one I just bought. The requisite hue comes from combining baking soda with non-alkalized cocoa powder (as opposed to Dutch-process, which has had its acid neutralized) - bicarbonate of soda reacts with the natural acid present in untreated cocoa to intensify the colour and lend it a reddish tint. As usual, your site inspires... It's great to look at and has us all running out for new books and heading for the kitchen to try to replicate your talents. I do so love all your chocolate posts, they fulfil all my chocoholic dreams! If I may ask, what sort of frosting did you use for the devil's food cake? Did you make it yourself or did you buy it from somewhere? Okay, I must have the chocolate chip butter balls recipe and I don't own the book. Can I persuade you to email it? Stunning, original photos--but then, that's why I come here! Tell the truth now...you're a food stylist, arent you! I just cannot get over how perfect your pictures are! If you arent, and you are looking for work...it pays well, and you certainly are qualified! My goodness, are you ever! Outstanding. Mind numbingly amazing. J - I'm going to try and make those choc chip balls, Lisa Yockelson has the recipe in her other book (it's called pillows though, so I hope it is the same one) Thanks for inspiring as always with the great pixs and write ups. 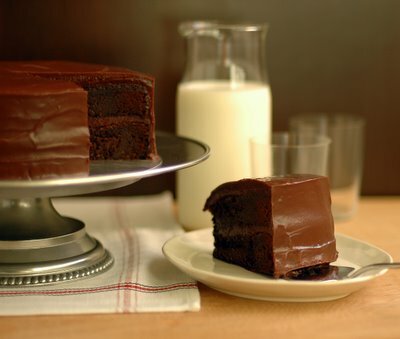 J - nothing is more comforting than an old-fashion chocolate cake. Your cake looks majestically rich and delicious! Your chocolate chip butter rolls makes me yearn for those decadent melt in your month moments now!!! I have come back (again) to look at your gorgeous creation! I'm in love with that first photo, how very definitively classic that cake looks. I also adore the cake stand, the styling is perfect. Hi J, good job. I 've tried her cocoa chocolate chip pillow recipe in her "baking by flavor" book. but theu look completly diffrenent.? hi michelle, thanks! baking really is art-meets-science isn't it? hi bajanchic, thanks for dropping by, and allowing me to discover your lovely blog! hi lori, can't wait to see you post about it! hi boolicious, good luck and happy baking! hi steffles, thanks for your kind words; glad you like what you see! hi tara, thanks! the cake stand is a pewter piece inspired by a william and mary paten design from the V&A's archives. That devil chocolate cake looks just so attractive to me. I wish i could have a piece of it. By th way, i love love love your vintage cakestand, it's so beautiful.